Mouse anti Huntingtin antibody, clone HDB4E10 (MCA2050) used to demonstrate perinuclear huntingtin expression and it's co-localization with the endoplasmic reticulum by immunofluorescence. Confocal microscopy experiments showing that HTT proteins are enriched in the perinuclear and co-localize with the endoplasmic reticulum (ER) marker calreticulin upon tratment of Rp-cAMP or 8-pCpt2'-O-Me-cAMP (8-pCpt-cAMP). 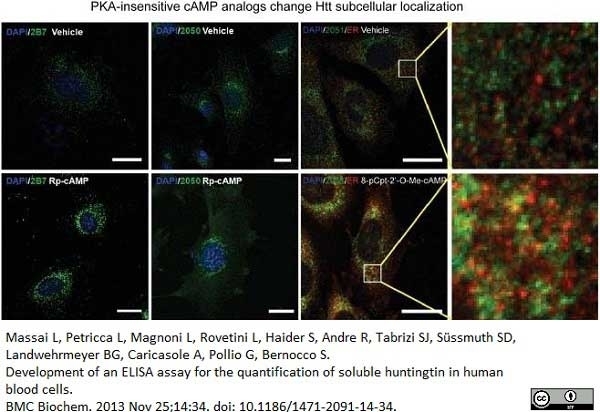 upper panels representative images showing the immunofluorescent signals og Htt (green), ER marker (redonly in the third and fourth columns) and DAPI (blue) in STHdh Q7/Q11 cells treated by vehicle, iμM Rp-cAMP or 1μ 8-pCpt-cAMP. Scale bars, 20 μM. The two panels on the right side are magnified images from the left for visualizing the co-localization. Yellow pixels indicate co-localization. From: Yao Y, Cui X, Al-Ramahi I, Sun X, Li B, Hou J, Difiglia M, Palacino J, Wu ZY, Ma L, Botas J, Lu B. A striatal-enriched intronic GPCR modulates huntingtin levels and toxicity. Elife. 2015 Mar 4;4. Mouse anti Huntingtin antibody, clone HDB4E10 (MCA2050) used for the detection of huntingtin in recombinant mutant Htt samles by ELISA. Full-length HTT-Q138 purification and standard curve for HTT-ELISA assay. Panel A, Gel coomassie staining of samples from the HTT-Q138 purification process (lane 1: molecular weight standard; lane 2: 30 μg RL1 cell lysate before induction; lane 3: 30 μg RL1 cell lysate 24 h post induction; lane 4: anti-FLAG affinity gel flow trough; lane 5–6: gel washes; lane 7–9: 5 μL of eluted fractions). Panel B, Western blot stained with anti-FLAG (lanes sequence as in panel A). Panel C, HTT-ELISA assay standard curve displays absorbance calibration values in duplicates individually. Curve showed is a representative example of multiple assays. From: Massai L, Petricca L, Magnoni L, Rovetini L, Haider S, Andre R, Tabrizi SJ, Süssmuth SD, Landwehrmeyer BG, Caricasole A, Pollio G, Bernocco S. Development of an ELISA assay for the quantification of soluble huntingtin in human blood cells. BMC Biochem. 2013 Nov 25;14:34. Mouse anti Huntingtin antibody, clone HDB4E10 (MCA2050) used for the detection of huntingtin in mammalian cell lysates by ELISA. 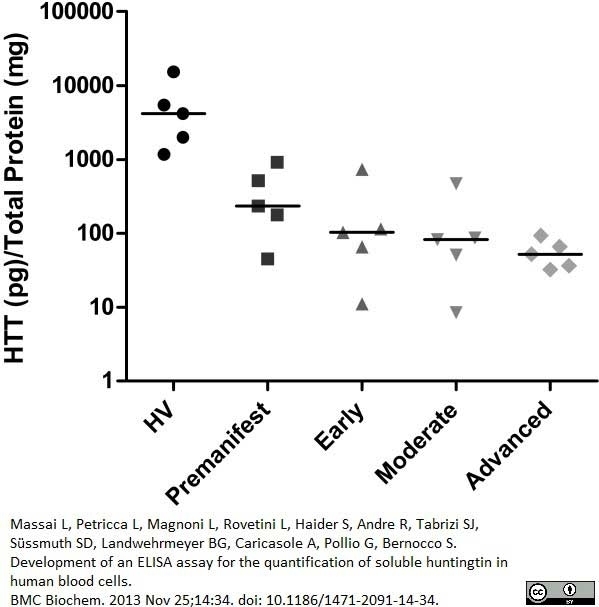 HTT-Q138 and HTT-Q17 quantification in mammalian cell lysates sample. Panel A, Fold-induction of HTT-Q138 expression detected with ELISA assay in uninduced and induced RL1 cells. Panel B, HTT-ELISA analysis of HEK293 cells transfected with full-length HTT-Q17 and HTT-Q138. 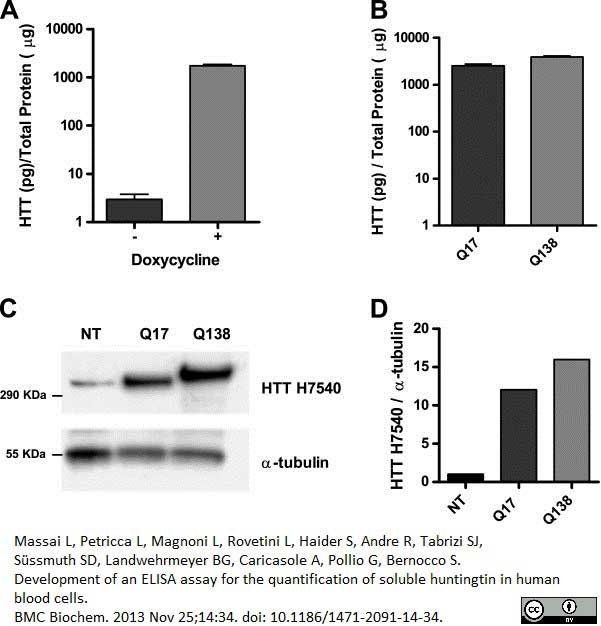 Panel C and D, Western blot and densitometry analysis of HTT-Q17 and HTT-Q138 transfected HEK293 cells. 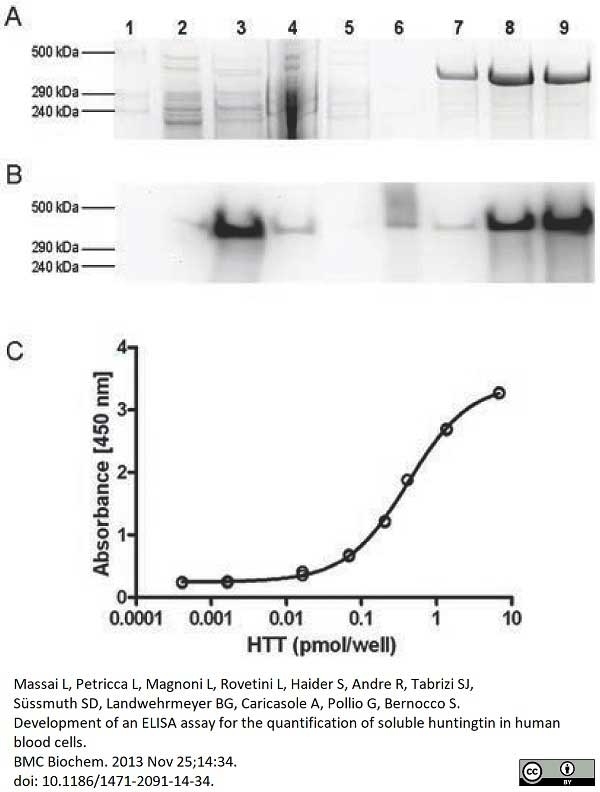 The blot was probed with antibodies specific for HTT (HTT-H7540) and α-tubulin (loading control). 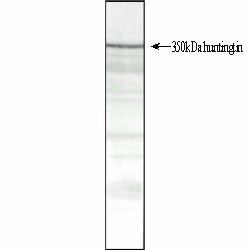 Mouse anti Huntingtin antibody, clone HDB4E10 used for the detection of huntingtin in mammalian cell lysates and he effect of Hsp90 overexpression by ELISA. Pharmacological assay validation. Panel A and B, Effect of HSP90 overexpression on HTT protein (by ELISA) and gene (by RT-PCR) respectively. Panel C and D, Effect of HSP90 inhibition by NVP-AUY922 on HTT protein (by ELISA) and gene (by RT-PCR) respectively. Readings are normalized against Ctrl or DMSO as appropriate; statistical analyses are performed with two-way ANOVA followed by Bonferroni test for multiple comparisons (* p < 0.05, ** p < 0.01 wrt Ctrl or DMSO). Mouse anti Huntingtin antibody, clone HDB4E10 (MCA2050) used for the detection of huntingtin in Huntington disease patient blood cell lysates by ELISA. HTT detection in blood cells sample. Quantification by HTT-ELISA on human PBMC total lysates from HD patients at different disease stages, premanifest and healthy volunteers controls (HV). Gene carrier samples were significantly different from healthy controls (one-way ANOVA followed by Bonferroni test for multiple comparisons wrt HV group, p < 0.001). Individual estimates and median values are displayed in logarithmic scale. From: Massai L, Petricca L, Magnoni L, Rovetini L, Haider S, Andre R, Tabrizi SJ, Süssmuth SD, Landwehrmeyer BG, Caricasole A, Pollio G, Bernocco S.
Development of an ELISA assay for the quantification of soluble huntingtin in human blood cells. BMC Biochem. 2013 Nov 25;14:34. Mouse anti Huntingtin antibody, clone HDB4E10 reacts with an epitope corresponding to the HDB region (amino acids 1844 - 2131) of the huntingtin protein. Mouse anti Huntingtin antibody, clone HDB4E10 detects a ~350 kDa band on western blots but also detects smaller degradation products of huntingtin. The combined use of Mouse anti Huntingtin antibody, clones HDB4E10 (MCA2050) and HDC8A4 (MCA2051) demonstrate that huntingtin is enriched in neuronal cells in the brain (Jones 1999). Recombinant protein corresponding to amino acids 1844 - 2131 of huntingtin. 1 Increased cytoplasmic staining, relative to nuclear, has been reported using formaldehyde as a fixative compared with acetone/methanol, see Wilkinson et al. Wilkinson, F. L. et al. (1999) Localization of rabbit huntingtin using a new panel of monoclonal antibodies. Molecular Brain Research. 69: 10-20. Yao Y et al. (2015) A striatal-enriched intronic GPCR modulates huntingtin levels and toxicity. Shirasaki, D.I. et al. (2012) Network organization of the huntingtin proteomic interactome in mammalian brain. Jones, A.L. (1999) The localization and interactions of huntingtin. Philos Trans R Soc Lond B Biol Sci. 354 (1386): 1021-7. Tao, T. & Tartakoff, A.M. (2001) Nuclear relocation of normal huntingtin. Massai, L. et al. 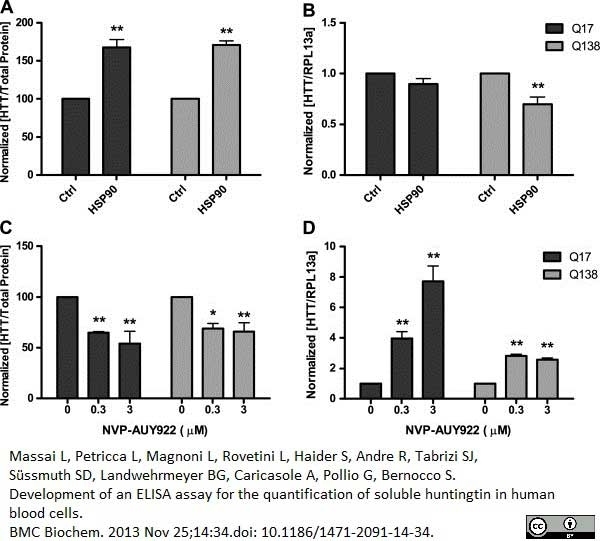 (2013) Development of an ELISA assay for the quantification of soluble huntingtin in human blood cells. Ni, C.L. et al. (2016) Polyglutamine Tract Expansion Increases S-Nitrosylation of Huntingtin and Ataxin-1. PLoS One. 11 (9): e0163359.